My regular reader, Ijya Paudel, will be going to Gorkha, Nepal in order to volunteer for a program called Sambhav Nepal with a mission to provide Nepali kids with proper schooling and she likes to share her project with all of you here. Sambhav Nepal is a registered non-profit, non-political, social organization aiming to establish and implement sustainable education, health, and community development programs in isolated areas of Nepal. Presently, the organization is working in 29 VDC’s of the Gorkha district.They are a community organization that deals with advocacy, skill building and most importantly education. When we grow up in a Western and developed society we often take things for granted. Sambhav Nepal works with governmental schools, which are very low funded and ran inefficiently. The students in these schools are struggling with getting regular school supplies and proper education. They do not have adequate furniture, stationary, books, art supplies, sports equipment or a proper library. Where you are born shouldn’t determine whether you get an education or not. By donating, you give these kids what they are missing the most: A CHANCE. An opportunity to show that they can be somebody. My goal is to raise $2000 dollars by the end of November, 2013. I want to donate this sum of money so these students could get a chance at a better education. These $2000 dollars would not only buy their school supplies and furniture but, also help provide the students with proper school uniforms. These students just need a little help to reach their potential. We can do so by donating a small amount of money. If you donate any amount starting from $5 dollars and above, your name will be entered in a raffle. At the end of this project, I will be drawing a random name and you will win an iPad. Please consider this as a chance to help those who really need it. Giving back is a beautiful thing. I hope you consider. Please help Ijya by donating and sharing this page. Thank you everyone. 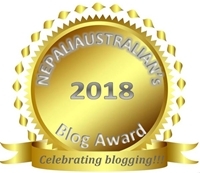 This entry was posted in Nepal 2012 / 2013, Social Issue and tagged charity, donation, governmental schools, help, M from nepaliaustralian, nepali australian, Nepaliaustralian, proper education, Sambhav, Sambhav Nepal, Sambhav Nepal Project, school uniforms, sustainable education. Bookmark the permalink. That is good to know nelle. Hope they are behaving themselves and not causing any problem to you and others. I am interested to know more about it. You are welcome gal. Wish you all the best.